Woohoo - today's the day that everyone can get their favourite products from the new Occasions Catalogue AND get a FREE Sale-A-Bration product with every $90 spend! If you haven't yet seen all the mouth-droolingly gorgeous new products, click here to see the PDF version of the Occasions Catalogue and here to see the fantastic selection of FREE Sale-A-Bration products that can be earned. 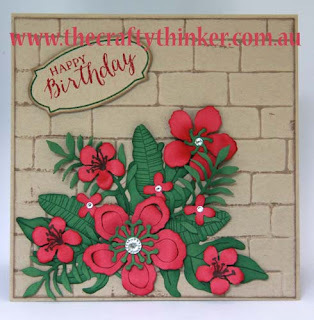 Today I've had tremendous fun with the Botanical Blooms Bundle! I was inspired by the Global Design Project challenge set by Brian King to use these three colours. I'll confess that at first glance I wasn't very inspired by the colour choice! 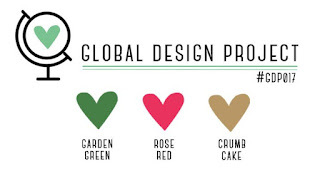 But after a bit of thought I realised that green and pink are perfect for flowers and crumb cake could become a garden wall. Thanks Brian - it really was a great challenge. I've really fallen hard for the Botanicals Blooms bundle because they all work perfectly with each other and they're so versatile! I can see a lot of mixing and matching going on with this set! The best bit for me, though, is that it's so easy to make a pretty design with them - it almost "builds" itself! I stamped some flowers from the Botanical Blooms set inside the card and the greeting is from a free Sale-A-Bration set called Perfect Pairings (141261 for the clear stamps), which I love for it's bold but elegant sentiments. Stephanie - these gorgeous flowers really pop against this Crumb Cake brick wall. What a beautiful card! Thanks for playing along with this week's Color Challenge at the Global Design Project. Thanks, Brian. And thank you again for setting a great challenge. Yes, the Crumb Cake brick wall is great. Did you enhance the appearance with some variations in the appearance of the mortar among the bricks? The flower and greenery have great contrast with the brick wall. Hi Brent. Thanks for your great question. Yes, I did enhance it just a little bit. 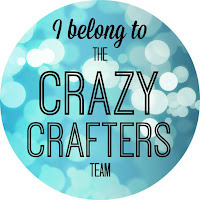 I simply swiped my crumb cake ink pad across one side of the embossing folder before I added the paper and ran it through the Big Shot. I inked the side where the lines for the mortar stick out on the embossing folder. Stephanie, your climbing flowers are just lovely! The Botanicals suite is also becoming a fast favourite of mine too. Great use of a tricky colour scheme. Thanks for playing at Global Design Project with us this week. 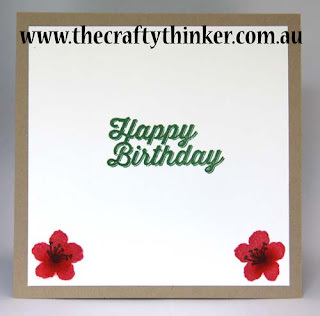 Lovely use of these new dies. The botanicals go great with this color combo. Thanks for playing with Global Design Project.